What is a "Google My Business" listing? A Google Listing, officially known as "Google My Business" by Google. Is one of the most important points of your online presence next to your website. For those who may not know what i'm talking about, your "Google My Business" listing is the little box that comes up in Google when someone searches for your business. It's also a place where customers can leave reviews, and share photos. If you ever want to rank at the top of Google search organically (without paying for ads), claiming or creating this listing properly is the single most important step. Why is a "Google My Business" Listing Important? An optimized "Google my Business" listing, is key to attracting new clients, building trust with potential clients, and building a presence in local search. Your Google listing is the first thing that will come up any time a client searched for your name or office. It's also a place where past clients can leave reviews/feedback which as a realtor you know is extremely important. Now what makes your "Google my Business' listing so powerful, is that it doesn't just show up when people search for YOU. It can also be optimized to show up when people search for lets say... "Real estate agents in Barrie". When people search for something like this on Google, Google decided what the top 3 most relevant results are, and displays them in what is known as the "Local Pack". Getting your listing into this local pack for key search terms, can add a huge boost to your business. Optimizing your business and listing to come up in local organic search, is called "Local SEO". Local SEO involved more than just a perfectly crafted Google listing, other factors are involved such as the quality of your website, frequency of content published around the web such as social media, how many reputable sources link back to your website, and how many directories are you accurately listed on. All of this plays a roll, but if you're going to do one single thing, pay attention to your Google Listing, it contributes more to Local SEO than any other single factor. Once your business is found in the local pack, users can click your listing to get an expanded view of your full Google my Business listing on Google maps. This will include all of your reviews, a link to your website, contact information, hours, and more. Take a look below to see what it looks like when we open one of the results from the local pack pictured above. So it's quite clear that Google my Business is quite an important part of your online presence. You understand that you need one, and you need to optimize it to perform as well as it possibly can. The goal is to get in front of as many potential clients as possible organically. But the question is how do you do it? How should a real estate agent or brokerage optimize their Google business listing to rank as high as possible in local search? Below we're going to share some very important tips for both agents and brokers/owners. Follow these tips and you'll be well on your way to dominating in local search. For Independent Realtors working at a brokerage - i.e ReMax, Royal LePage, Century 21, etc. These tips are for independent realtors, meaning you're working at an agency and you want to have your own google listing. Can you do it? Of course, but 90% of real estate agents are doing it wrong, and may eventually be blacklisted because of it. Before we start sharing tips, please note we're assuming you already have a Google My Business account. You simply need to log in and make the necessary changes as per our suggestions. But if you have not made yourself a listing yet, you can do so HERE. Tip #1 - Does your brokerage have a listing? The very first tip is make sure your brokerage or local branch office has it's own Google my business listing. It's imperative to both your success as well as theirs. Talk to your marketing representative and ensure this gets set up. It's free, and massively important, so no excuse as to why it can't be done. See below for what a listing looks like for an independent branch office. By far the biggest mistake realtors make when creating their Google listing is the name. Most of them use something like: "RE/MAX-John Doe" or "Royal LePage - Barrie - John Doe". Even "John Doe Real Estate". Yes, including the name of your brokerage and/or city/province will help you rank in local search. Actually it will help a lot. But in 9 out of 10 cases you will be violating Googles Terms & Conditions. Which means you can be blacklisted never to be found in search again, or have your account permanently deleted/frozen. Both of which are not favourable outcomes. Of course you know realtors who do it this way, and yes they haven't any issues yet, but they probably will. Maybe not this year, or next year but eventually they will. So if you're in real estate for the long term, follow the rules, and you'll be rewarded. When your competition suddenly drops from Google search and you're the last one standing getting all of the local business, you'll thank us for it. So how do you correctly set up your google my business listing name? As a real estate agent working at a brokerage with multiple other agents it's quite simple. Link your personal website, phone number, email etc. If you have a suite number, list on the the second address line. 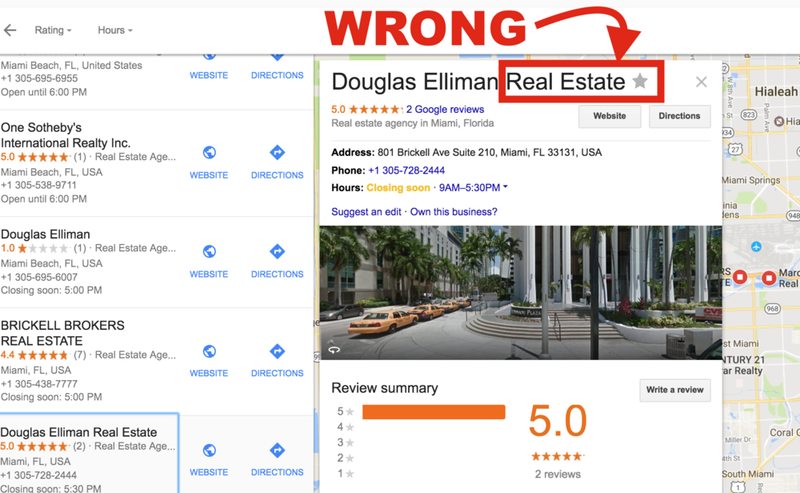 Disclaimer: This is the proper way as recommended by Google, and the only way we can in Good moral standing suggest you setup your listing. However... at your own risk... including your brokerage name such as ReMax in the name i.e "John Doe - RE/MAX" will increase your visibility. But if Google ever cracks down, you'll likely loose this privilege forever. When creating a Google My Business account, you should be prompted to create a Google+ account as well. This is essentially a social media channel very much like Facebook. The great thing about Google+ is it's high rank in Google search (of course Google will rank it's own content highest). It's a good habit to regularly publish to this channel, and it should be a part of your overall social media strategy. Great for building up your local SEO authority. Anyway, in the about/description section of your Google+ listing, you should list what brokerage you're working for, what areas you service, etc. But leave it out of the name if you want to remain in Google's good graces. You can also include here any information about yourself, your years in business, or anything you'd like potential clients to know. Don't be afraid to include clever keywords if they are truly relevant such as "award winning realtor" or winner of "the 2016 realtor awards" or "top agent in Ontario" etc. Every Google listing will provide you with the option to link to your website. Viewers of your listing will see a button allowing them to access your website with a simple click. This is the natural next step that most people take when they come across your Google listing, so it's important that your website is set up to convert potential clients as efficiently as possible. Make sure all of the information on your website is consistent with that of your Google listing. Correct address, phone number, & email address. An easy to use contact form. It's important to take some time to update all of the above mentioned points. The reason for this is that if Google finds discrepancies between your listing and other online assets such as your website or social media, it is less likely to return your listing in local search results. The other items such as frequent blog posts, are meant to help boost your SEO and allows your website to be found as many times as possible by clients searching for what you offer. So make sure you website is up to date, looks good, and is ready to convert! Insider Tip: Opt to go with a domain name such as www.homesforsalebarrie.com or www.torontocondos.com, something that would rank high in search for terms that relate to what you do. . Although your Google Listing is one of the most important parts of your online presence besides your website, and the topic of this entire article, it's not the only part. Keep in mind the your Google Listing is only one of many directories and listings that are out their for your business. Many have likely been created already only your behalf without your knowledge. It's important to search for and claim these listings, and create as many new ones as possible. You want to be found everywhere, and you want the information to be consistent. Another huge factor of your online presence is social media. Find what platforms work best to reach your target clientele, and put together a social media marketing plan. Figure out what you're going to post, how often you're going to post it, and how you're going to promote it. Social media as a whole, is becoming the single most powerful media outlet in the world, it arguable already is. Unlike a simple Google listing, social media is a proactive platform that you can build and use to actively connect with new clients. Take control of your social media before it's to late. I've personally spoken with realtors in Toronto who have sold multiple 5 million dollar plus, condos and homes through social media. Unbelievable right? Even if you invest what feels like a massive 10k a year into social media, wouldn't it be worth it if you sold even just one property because of it? Chances are you will, chances are you'll sell a lot more than just one. Lastly, do not underestimate the power of your overall online reputation. Weather it's your social media, your Google listing, Yelp, it doesn't matter. 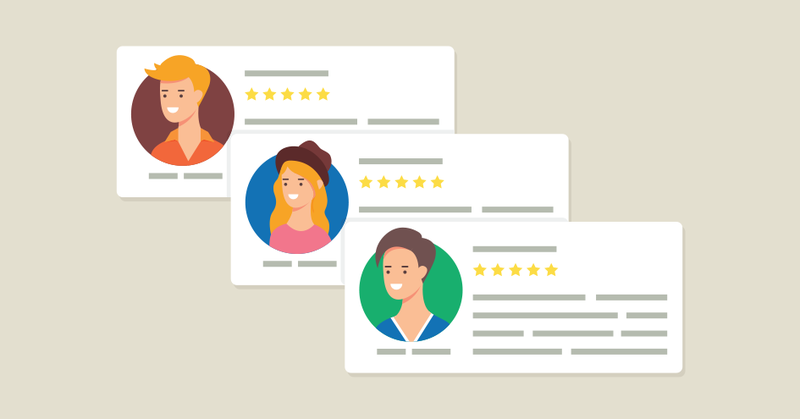 Make sure you're actively aware of what people are saying about you, engage with the frequently and make it a habit to respond to reviews, comments, and anything else as fast as possible. This will boost your credibility in the eyes of customers, and likely result in more word of mouth referrals and ultimately sales. Congratulations on actually making it to the end, that was no easy read. Typically we would package this up as a short E-Book and offer it to our existing clients. But recently due to popular demand and endless questions, we thought it would be great to publish this publicly and share it with everyone. We hope you enjoyed the read, and learned at least a trick or two that you can apply today. If you have any questions at all about the material in this article, or would like to hear more about our digital marketing services, please contact us now.